OK, stop. You had me at “clockwork fox”. Peter Bunzl’s debut is a gripping penny-dreadful of an adventure, with the nastiest of pantomime villains, the bravest of heroines, the darkest of secrets, and the most smart-mouthed of clockwork foxes. 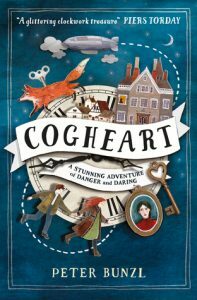 In this alternate Victorian England, great engineers like Lily’s father create mechanical people – walking, talking servants (because this is class-ridden Victorian England, after all); and mechanimals – mechanical animals – like Malkin the fox. Each mechanical is powered by a sophisticated clockwork mechanism, and has to be powered by winding with its own unique key. The skies above England are crossed by airships – of course they are. This is steampunk, after all, and what’s steampunk without airships? The whole scenario is hardly original, but Bunzl writes with such gusto that the tiredest of steampunk cliches seems almost fresh and new. As the story begins, Lily’s absent father is missing, presumed dead. Malkin, the fox created by her father, has been tasked with passing on one last message to Lily, but is waylaid by villains. What is her father’s secret? And why would her father’s secret put Lily herself in such danger? With Malkin and Robert, she sets out to solve the mystery. The action never relents. The trio of Lily, Robert, and Malkin are thrown into predicament after predicament, and it’s only through their bravery and cleverness that they stay one step ahead of the horrid villains who are on their trail. The pace of the book is astonishing – it’s a real page-turner. The characters make you care, too. Lily is a feisty heroine in the great tradition of adventure stories, and Robert, by nature less daring, grows into his role as the story progresses. Malkin the opinionated fox provides the comic relief – which at times is needed, because this is a story with moments of real darkness and despair. The cover – art by Becca Stadtlander (who also provides the interior illustration) and design by Kath Millichope – draws you right in, with its depiction of Robert and Lily running, the airship, and the prominently-displayed Malkin. You know exactly what sort of adventure you’re going to get from the moment you pick up the book! It certainly worked for me – I picked up the book because of the cover, started reading the prologue, and before I knew it I was walking to the till. I even started reading it on the bus home. This is an excellent debut, and while the story comes to a satisfying conclusion, there are still mysteries to be investigated and secrets to discover, so I’ll look forward to more adventures of Lily, Robert, and (most of all) Malkin.